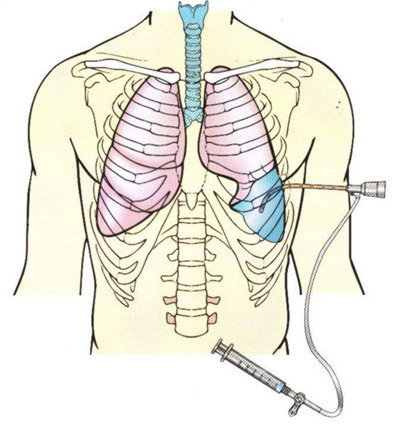 A thoracentesis is the aspiration of fluid (pleural effusion) from the space around the lungs (pleural space). This is performed utilizing a local anesthesia. This procedure may be performed for diagnostic reasons such as when there is an unknown cause for pleural effusion. Just as often a thoracentesis is performed for therapeutic reasons where the cause of the pleural effusion is known, but repeat drainage of the fluid is required to improve respiratory symptoms. Thoracenteses are performed in the Endoscopy Department at John Muir Medical Center, Walnut Creek.